A very nice lunch with our friends ... Michelle, Lizzy, and Lily (Lizzy's three month old baby). We had the pleasure of introducing them to one of our favorite spots: Jack's Wood-Fired Oven. They had been there once previously, but only for dessert. Yesterday we all had pizza and soup, and then dessert as well. The soup was one of my favorites there: cream of fire-roasted tomato. The personal-sized pizzas we chose were all excellent. When it came to dessert, they were out of our favorite (their lemon cake with raspberries) – so we tried three other desserts and shared them. One of them, a chocolate layer cake, was made by the same bakery that makes the lemon cake, and it was really good – smooth, moist, and drenched with intense chocolate flavor. The other two – an Italian pineapple cream confection, and vanilla creme brulee – were made in-house. 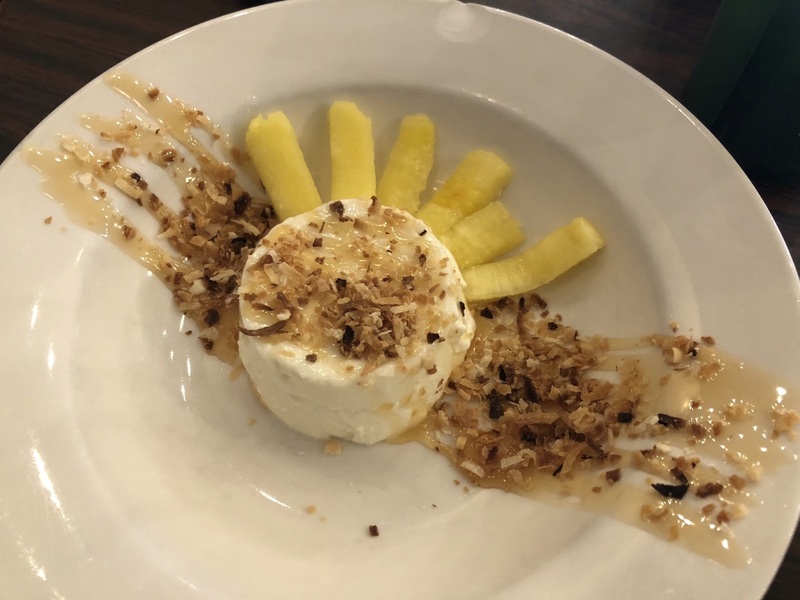 Our delightful waitress strongly recommended the pineapple cream dish, so I ordered that (photo above). The creme brulee I didn't try, as Lizzy was shoveling it into her mouth as fast as she could; I thought sampling it might be dangerous. :) The pineapple dish was spectacular. Our waitress has excellent taste! Lizzy pronounced the creme brulee the equal of any she's had, and it looked nearly identical to our gold standard: the Gastognome's creme brulee.